Fellow Illini... We need your help and ideas! Choose an event. Share with us your ideas as to potential club activities which you think may be of interest. Discuss your idea with other club leaders. Again, we're glad to help you! Contact Alex or Mark. 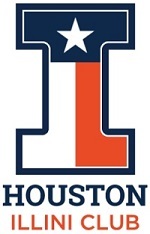 Mark will invite you to our Google!Group as it provides an easy way to discuss your ideas with other Houston Illini club volunteers and officers. Choose a date that works for you. Ideally choose a few dates that work on your calendar. Share those dates through the Google!Group to identify preferred date(s) by other club leaders. Plan the event. If reservations are required, be sure to first e-mail Alex. If applicable Alex will also furnish you items that will likely be helpful for your event, such as Illinois table tents, name tags, etc..
Write a brief event description. E-mail it to Mark as he will post the event on the website and notify the club by e-mail. We will also post your event to the club's Facebook page. Make any final reservations and preparations. If a down-payment is required, find out the amount due, and work with Alex to assure payment. Any event requiring advance reservations and a payment will need to be posted sufficiently early to allow club members sufficient time to send in their checks to the club's P.O. Box. Come to the event! Wear something distinctive, ideally with orange and blue, to build the Illini spirit and help others identify you as Illini. The more the merrier! Naturally, be hospitable to all Illini and their guests. Should you encounter any Illini who are not currently members please encourage them to visit our website to learn more, and to join or renew.